The SK-1 was a remarkable instrument for its time. And that’s why I think it deserves a special recognition. As a kid, I remember going into department stores and toy stores and there would always be kids fighting over who got to play with the SK-1 (and later the SK-5). Of course, nobody wanted to play music on it. Everyone wanted to record their voice, or fart-noises, burps, or whatever they could come up with, then play it back on the keyboard. Piano – Excellent choice, and by far the best instrument on the device. Brass Ensemble – Semi useful. I often use this for a bass instrument as it is the closest thing there is. Trumpet – Sounds decent, probably a good choice to have. Flute – Another great choice. I use this often. Human Voice – A terrible instrument. It sounds cool , and I’m sure the kids loved it, but it isn’t really useful for playing music. Mostly because it has this repeating echo loop. Had they given a constant tone like somebody singing, that might have been better. Pipe Organ – Well, I guess it was a decent choice to add, because some people want to play an organ. Jazz Organ – Okay, so they give us 8 instruments and they decide to make two of them an Organ? Seriously? Couldn’t they have given us some strings, or bell sounds instead? So there you have it. Of the 8 instruments they provided, I really only use maybe 4 or 5 of them. Oh how I wish they would have given us some bell sounds or strings. 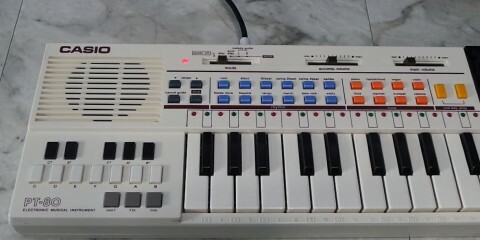 So it does have a built in synthesizer. But my experience is that it is difficult to really create anything useful. The main problem is no matter what you do, it will always be a modified sine-wave. You can’t change the waveform at all. However, I do like the fact you can change the envelope of any sound, including the built in sounds, or even sounds you record yourself. That comes in handy. Speaking of sounds you record yourself, surprising this thing has a 1/8″ phone jack for line-input as well as a full sized 1/4″ phone jack for a microphone.